Japanese contemporary choreographer Hiroaki Umeda recently presented his new choreography Peripheral Stream with L.A. Dance Project at Théâtre du Châtelet in Paris. in 2013, he worked with an ensemble of 11 dancers from GöteborgsOperans Danskompani in Sweden. In the piece, Interfacial Scale, Umeda created the choreography, set, costume, light and sound design. As well as being a choreographer and dancer, Umeda is a visual artist, photographer and video artist. He established his own company S20 in 2000. Umeda has entered the international scene with his multimedia performance works that employ his own body and self-created video images, music and lighting designs. These are recorded on a single notebook computer. FIRSTINDIGO&LIFESTYLE: You are known for your own choreographic language that has influences from different styles, and, from the movement point of view is highly flowing and gestural. Is there a way to trace the evolution of it, how did the movement develop? Hiroaki Umeda: I started to dance at the age of 20, which is very late in general. At the beginning, I took some dance classes, such as Ballet, Hip Hop and etc. After a year of taking some dance lessons, I realized that there is no specific “dance style” that I want to learn: the dance I wanted to pursue had in fact not existed yet. Plus, I found that what is interesting for me in dance was, not the style, but what lays beneath those styles which is the “principal of movement.” So I started figuring out and understanding the principal of movement by myself, then I applied that principal to my body movement. I would say that my dance should be addressed not as dance but rather as a movement, since I focus on, again, what lays beneath the system of dance, which is the system of movement. HIROAKI UMEDA: “Haptic.” Photo: Shin Yamagata. You are a Japanese contemporary choreographer, can you describe the dance scene in Japan? HU: I have been accepted more abroad than in Japan from the beginning of my career, so I cannot say much on behalf of the Japanese choreographers about what you are asking. However, I personally feel that contemporary dance scene in Japan has not been developed enough yet. The scene is very closed. But on the other hand, it is also true that because of the close-knit circumstances, it has developed very idiosyncratic styles. I cannot say if this close-knit condition is good or not good for the Japanese contemporary dance scene. Anyway, in Japan now, there are so many people who have been struggling and working hard to develop and open-up the scene more; that is a really big hope for me and I thank them a lot. You started your artistic career with photography, and then moved towards dance, how did this transition happen? HU: I was looking for an art style, which can accept real-time expression, thus, more than photography, I found that dance could be suitable for what I want to express. Dance is an art form in which I can physically put myself into in real time. In photography, on the contrary, it was really hard for me to materialize a piece in real. That is why I shifted to dance from photography. However, I have not totally detached myself from the photographic art form since I have been taking a standpoint throughout that dance can be a form of visual art. 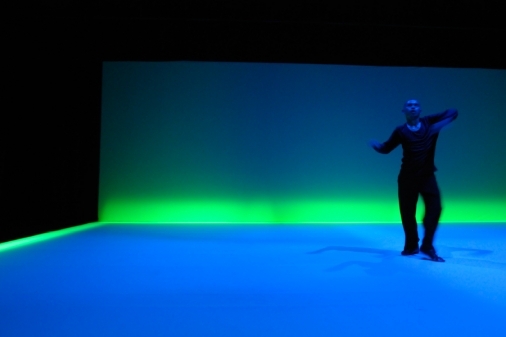 Lighting design, which I learned in photography, is now an essential factor for a dance piece. The way you construct your choreography seems multidisciplinary. The sound and lighting design, and the visual dimension is crucial in your composition? Can you even differentiate which comes first? HU: In practice, I start from abstract drawings, in fact, just lines. This drawing expresses my image of the tension of space, and it functions like the score of the piece to become. According to the drawings, which envision the whole image of the piece, I put together all materials, such as sound, light, dance and etc. The visual addition or sometimes ’distortion’ makes your compositions also appear aesthetically ’charged’, could you say something about it? HU: In my work, I focus a lot on how the bodily sensation could emerge from the space, and how, in turn, the bodily sensation could change the tension of space. That is, first and foremost, what I am interested in. The basic composition of my piece is always based on choreographing the tension of the space. By acutely tuning into the space, it is possible to attain a lot of stimuli that can provide you with physical sensations. What does it culturally mean to be a Japanese choreographer now, from the point of view of globalization? HU: have not been working consciously as a “Japanese” choreographer. I have been working as just an artist, focusing on how to bring my pieces to more people all over the world. I think that it is more important to be one of the many artists of the world, than just a Japanese artist. Does Butoh as art movement mean anything to you? How about Kabuki, Gutai, and action art? They have also called you ’’avant-garde’’? What role a nature and technology play in your mind-set? HU: Nature and technology are not oppositional concepts for me. As a matter of fact, technology is a tool to understand and approximate nature. By the same token, I think that human beings and art, which human beings create, are a part of nature. Where did you grow up? Where do you work these days? HU: For the last several years I have been traveling almost all year round. I grew up in Tokyo, and I consider Tokyo as my hometown. But I have been working everywhere in the world. I think that what I do in my art is not connected to any specific country, city or place, so actually I don’t mind working any place in the world. You did a work for Gothenburg Dance Company (GöteborgsOperans Danskompani). How was it to work in Sweden, also in terms of cultural exchange? Did dancers like the movement? HU: Dancers of the company were from all over the world. They were really skillful and had great intelligence, and were very professional. To start off with, I gave them a system of movement which becomes the under layer of my choreography, and the dancers tried to find their own movements from tapping into that system. I am sure that I enjoyed seeing their movements develop from my system, even more than they enjoyed learning my system. At the moment, I have limited experience as a choreographer for big companies so the dancers helped me a lot and I learned so much from them. I would say that the process was more of collaboration, rather than providing choreography to the dancers. In terms of the cultural exchange you are asking, the company was too international to feel any specific cultural differences. I would say that working with them was rather like a kind of universal project, working in various mixed cultures. How was it to collaborate in Benjamin Millepied’s LA Dance Project 2? How was the audience response in Paris? HU: Compared to LA Dance Project, the Gothenburg Dance Company was strict in terms of working procedures and time schedule precisely because they are a huge public company; I needed to follow their administrative schedule in terms of creative process, which I totally understood. On the contrary, Benjamin’s LA Dance Project is, although they have diverse range or repertoire, still small in scale as a company. For this reason, I could work more closely with the dancers and staff that enabled me to go further and experiment more in the piece. To be very honest, I didn’t expect a good response from audience in the Châtlet. Surprisingly, however, the Paris audience quite openly accepted and appreciated my piece. I was impressed by their open-mindedness. Can you name some of your influence or mentors, colleagues? HU: There are too many names to list up here. What are your plans for the future, and dreams? HU: From last year, I have started making choreography devoid of human body. For me, human bodies are not the only elements for choreographic consideration. In fact, I want to really challenge choreographing anything with “movement,” and develop a dance piece with various elements. One of my dreams now is to choreograph water.